Design new instruments or improve the sensitivity of existing instruments. Mass spectrometers and other ion optics lens systems. Description: SIMION Version 8.1 is a software package primarily used to calculate electric fields and the trajectories of charged particles in those fields when given a configuration of electrodes with voltages and particle initial conditions, including optional RF (quasistatic), magnetic field, and collisional effects. 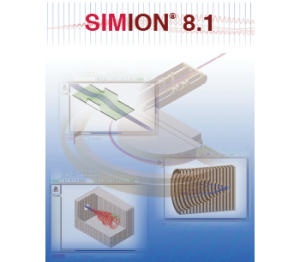 In this, SIMION 8.1 provides extensive supporting functionality in geometry definition, user programming, data recording, and visualization. It is an affordable but versatile platform, widely used for over 30 years to simulate lens, mass spec, and other types of particle optics systems. 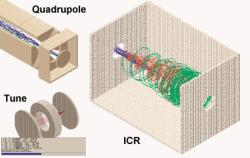 Applications: SIMION 8.1 is suitable for a wide variety of systems involving 2D or 3D, static low-frequency (MHz) RF fields: from ion flight through simple electrostatic and magnetic lenses to particle guns to highly complex instruments, including time-of-flight, ion traps, quadrupoles, ICR cells, and other MS, ion source and detector optics. For more information, please visit our simion.com web site dedicated to SIMION.